Charlton go into this weekends away game against Sheffield United no longer looking up the table, but most definitely looking back down over their shoulders. The devastating loss at Bloomfield Road last week may take some time to shrug off, as it almost certainly ended the clubs hopes of an automatic promotion spot. Now, Charlton have to retain and consolidate their play off position, having slipped to sixth place in the Championship after last weekends matches. That will be no easy feat; a number of other clubs have gathered around the fifty point mark (Charlton have 52), and they now will be looking upwards at us having got close to the relative safety that this points total brings with a dozen games to go in the season. So instead of concentrating on the fixtures and results of Stoke, Bristol City, Watford and West Brom, Addicks fans will now be trying to find out how Plymouth, Hull, Ipswich, and Burnley are doing at the weekends. It’s pretty easy to find out why Charlton have slipped back into the chasing pack – just three wins in the last 15 games is simply not promotion form. During those times, Alan Pardew has dumped the 4-5-1 formation that won away games but failed at home; tried out the runners in McLeod and Varney up front; seen centre forwards Iwelumo and Gray (top pic) fail to score a single goal; found a gem in left back Kelly Youga; brought in three loan players – Greg Halford, Lee Cook and Scott Sinclair; and seen the away form disintegrate while home form has improved. While we fans understood that it would take time at the beginning of the season for this squad of new players to gel, it is less well understood why the team is not more settled and still trying to gel going into March. Alan Pardew, please let us know? For the trip to Sheffield United, who Pardew picks is completely unknown, as the signing of another winger in Scott Sinclair (left, from Chelsea) has really upset team planning. Chelsea gave Sinclair options on whom he joined, preferring him to go to a positive club rather than a negative one (Leicester, who are fighting relegation…), but they will be expecting him to play each Charlton game between now and the end of the season. 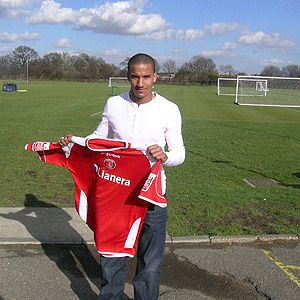 Otherwise, what was the point of him joining Charlton on loan. It is a very different loan singing to that of Halford or Cook, both of whom were on the fringes of their respective squads, and Charlton may well have options to buy both these players if they so wish once their loans are complete. That will not be the case for Sinclair, who is highly regarded, and has been a regular on the bench for the blues this year. So where does Sinclair fit in - it's not as if we are short of wingers is it? That really does depend what Pardew wants to do, not only in this game, but in the following home games against Bristol City and Preston. He could switch the formation back to a more solid looking 4-5-1 away from home, but that would intimate bringing in Jose Semedo, who hasn’t played much since December, to tighten up the midfield. How would Sinclair fit in then? 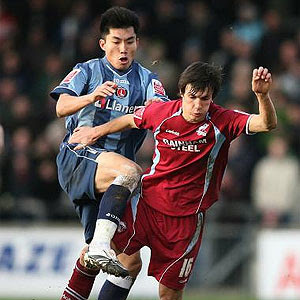 Would Pards favourite Zheng Zhi be dropped, or played wide? Would in-form Luke Varney play up front on his own or would he be pushed wide? Presuming Darren Ambrose is retained (as he has been one player scoring goals regularly in 2008…), and Sinclair plays wide on one side, who plays on the opposite flank – Ambrose, Varney, Thomas, Cook, or Sam? And if Pardew maintains the 4-4-2 formation, does this simply mean Ambrose and Sinclair in the wide positions, or does it mean that the versatile Sinclair will play either up front - alongside Gray, Iwelumo, or Varney - or behind them in a 4-5-1 variation? To me, this signing has really complicated selection…and if it complicates things to me as a supporter, then it probably complicates it for the rest of the playing squad too. The above side would give a 4-5-1 formation with Sinclair playing wide and ZiZi behind Varney - a variation that did work earlier this sason. It would be full of pace, and able to expose the vast open spaces at Bramall Lane. With a United team tired after 120 minutes of FA Cup football on Teeside on Wednesday, it could exploit a weakness in the opposition. Charlton’s defence took a physical pummelling last week at Blackpool, and then a verbal one from the manager too; I don’t know if Pards assertion that none of his previous teams had shipped five goals was true, but he certainly didn’t like it! Halford took stick personally, and Grant Basey also came in for criticism (albeit tempered by the fact that he is a teenager…); although Madjid Bougherra is still injured, the central defensive partnership of Fortune and McCarthy could be split after last weekends rout. I therefore expect to see Sam Sodje returned to the starting line up – he only dropped out through suspension followed by injury – and Kelly Youga will also return (after suspension). Out will go the young Basey and Fortune, who has never been a favourite of Pardew when the going gets tough. Halford may retain his place (one last chance? ), mainly because his obvious error last week didn’t actually cost Charlton points whereas replacement option Yassin Moutaouakil’s own comical mistake at Scunthorpe did. What Pards will want to see is a reaction, and the right sort, from his defence. Errors equal goals conceded - CUT THEM OUT! The home team will be loving this – they may be tired both mentally and physically after crashing out of the FA Cup, so will be hoping for an easy ride and a league win at the first time of asking at home for new manager Kevin Blackwell. The obvious danger man is ex-gay icon James Beattie, whose goalscoring has slowed since he was injured before Xmas; he is still probably the best centre forward in this league, so will be a complete handful for whoever plays in defence for the Addicks. Also to be closely watched are Rob Hulse, getting back to fitness after breaking his leg; Gary Speed (who always used to score against Charlton for Leeds, Everton, Newcastle and Bolton! ); and one time target, Michael Tonge. Hopefully they will all be tired or injured after the Boro game? Pedro45 is so useless at predicting results – every time I think we might win, we get stuffed, and then when I mentally give up hope, we pull something out of the bag. In some ways, I hope that I can predict results correctly, but when I think we will lose 2-0, as I do in this match, I so hope that I am wrong. Scott Sinclair could be a bright new dawn, but will Pardew know where to play him? Maybe we should just play eight defenders, give Scotty the ball on the edge of our area, and let him beat everyone to score – he does that regularly doesn’t he? My one-to-watch this week has to be Nicky Weaver (left). Now Darren Randolph is getting game time at Bury, Weaver doesn’t have much competition for a starting place – Rob Elliott not really being an option – and a number of the Blackpool goals last week came after Weaver failed to hold on to shots. Of course, he did well to save some of those shots initially, but the key is not putting the ball back into play and danger. The collective defence needs to protect Weaver (which didn’t happen at the Pleasure Beach! ), and also deal with anything that does come back into play, so the overall blame is not on his shoulders, but he was a part of the conceding team. Weaver has won points for Charlton this year - none more so than at home against Stoke! – but we continually have to hope that he commands his area, and catches crosses cleanly. He will get plenty of practice this weekend, so I hope he comes through as he will be key to any points won. The last two weeks have been a bit strange for the SE7 club – throwing away a two goal lead at home to Watford; a mid-season break in Spain, new signings bedding in; the youngsters doing well in the Youth Cup but slipping out heroically in the quarter finals; the directors pledging to cover the clubs financial shortfall; and the first team shipping five at the seaside. Now is the time for the men to stand up, as we desperately need to reverse the soft-touch away-day trend. Whereas I was lucky that my own Blackpool weekend - at the time of the win in Preston - was victorious, I doubt the fans who travelled up last night or this morning will be in much of a mood. A heavily strapped knee with three small holes in it prevented me going, and in some ways I'm thankful that I didn't have to endure the pain experienced watching five goals being shipped by a previously solid defence. I actually hurt more today mentally than I did when I got home yesterday after a general anaesthetic. Why we got stuffed is anyone's guess, and I suppose those that watched live will have better opinion. Pardew made two changes to the starting line up - Basey coming in at left back for the suspended Youga, and Cook replacing the out of sorts Sam on the wing. That really shouldn't have upset the balance too much, and nor should the conditions (windy), pitch (hard), or team before them (a footballing one rather than route one...). Pardew was not impressed by all accounts, yet having dragged themselves back from two goals down to equalise - thanks to two Darren Ambrose efforts - the second half was complete capitulation. The final goal was a Jon Fortune shot which made the score a little more respectable. Sure, efforts were made - Holland, Varney, Iwelumo, Gray, Zheng, and Halford all came close at various stages - but the goals conceded sounded awful. How much of a parry Nicky Weaver got on each shot that preceded the first three goals I don't know (the second did sound like a good save before the rebound went in) but if the keeper does knock the ball out, why did the defence not react too? 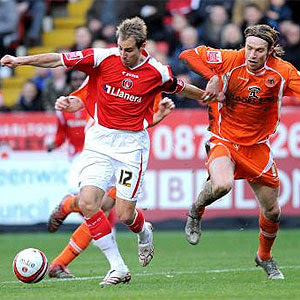 The final Blackpool goal summed up the day - was it a flukey cross or great chip over the keeper - who knows? Ultimately, in Pedro45's eyes, this defeat spells the end of any hope of automatic promotion - 12 games to go and eight points to make up on at least three teams is just too much, even if we have to play three of the teams above us. Now down to sixth, we could be out of the play off positions if Hull win their game in hand. Unfortunately, a knee operation, planned for this afternoon, will keep me from travelling up to Blackpool tomorrow for the next game in Charlton’s quest to get nearer the top sides in this division. Luckily, and importantly for the club, around 1500 supporters will be making the trip, and within a small-ish ground, the atmosphere should be electric. I hope they come home happy! I stayed in Blackpool (Big Blue Hotel, right by the Pleasure Beach, recommended) when we played Preston back in November, and it was a nice place to visit, though very alien to southern comparisons like Brighton or Southend. Those travelling should note that the trams are not running (contrary to the programme information), with bus replacements (which can be infrequent) along the length of the front. The Tower can also be closed in windy weather (as it was in November), and the Pleasure Beach opens at midday on Sundays if you are staying up there. A cab from Blackpool North station to the ground will cost around a fiver, though it is not that far to walk; from Blackpool South, or the Pleasure Beach, the ground is only a few minutes walk. Blackpool in November was hairy, to say the least, weather-wise, and a similar windy day is forecast; Pedro45 politely suggests that if the tide is in, you don’t get too close to the sea wall or you may be likely to get very wet! I have photographic proof! Alan Pardew will hopefully have improved the team spirit during a short break in Spain earlier in the week, and hope that this proves the catalyst in the thirteen “cup finals” the team now has to play between now and May. Pards team selection is not as straightforward as it has been at other times this season, and choices and decisions will have to be made, primarily as Kelly Youga is suspended for the match. In goal, Nicky Weaver should get the chance of another clean sheet, and a good performance; this is another game that he can win for the Addicks, and he will want to put in a good performance back up North. Just nine goals conceded in ten games is testament to how well Weaver is playing. Rob Elliott will deputise from the bench. Greg Halford should continue at right back, and hopefully he can make use of his enormous long throw in the blustery conditions. His defending has been solid if unspectacular in his first few games, but the key is him not making mistakes (a la Moutaouakil) and providing similar attacking options. The central defence will be marshalled by Paddy McCarthy, plus either Madjid Bougherra if he has recovered from his foot injury, or Jonathan Fortune if he hasn’t. 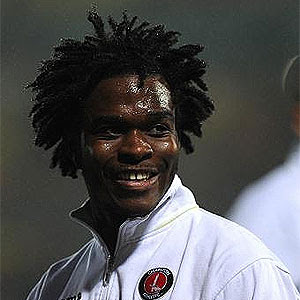 Both should be solid, and resolute, and we have Sam Sodje fit again in reserve. At left back, with Youga suspended, Pardew has to make the choice between Grant Basey, who played about five games in December when the team were on a good run, or Chris Powell, who seemed to be rolled out for every match early in the season even though he was desperate for a rest. Chris has now had that rest, so he may well be preferred to the young Basey in an important game such as this? Other choices like Ben Thatcher and Cory Gibbs are unlikely as, even though they are both back in training, neither has played enough reserve team football to be seriously considered, unless in emergency. I also doubt that part-time but able fill in Jose Semedo will be risked for a whole game in this position. The central midfield will once more, barring injury, see Matt Holland and Zheng Zhi paired; we need a big game from both. Out wide, Pards really has to start to make choices; it would appear that all four potential starters are fit enough, with Darren Ambrose recovered from illness, Jerome Thomas recovered from illness and injury, and Lee Cook getting more training and match time every week. Lloyd Sam is the only one who is seemingly 100% fit, but that might not be enough to keep him in the side this week. Sam has been a bit of a stalwart out on the right wing, and has bundles of skill. Sadly, his confidence seems a little low at the moment, and he is not getting his crosses in when he can, which is usually after he has beaten his man the first time. Lloyd needs to become a little more direct; with Andy Gray in the side now, an earlier cross is required than when Chris Iwelumo led the line, but they are just not coming, and Sam may face the chop as a result. Cook has been getting lots of web space on the official site, and he and Thomas will compete to start opposite Ambrose I feel. I wouldn’t be surprised to see Cook start, with Thomas brought on when he tires after an hour, though it may be vice-versa. Up front, the lone front-man has been laid to rest since the turn of the year, and we can expect to see Like Varney and Andy Gray start, with Iwelumo on the bench. Subs from – Elliott, Moutaouakil, Sodje, Bougherra, Powell, Racon, Semedo, Sam, Thomas, Iwelumo, McLeod. Blackpool played a good open game in the match at The Valley earlier this year, but were ripped apart by our midfield; they may not be so expansive at home, though I hope they are. They have added that loveable rogue Paul Dickov to their team since then, and he has responded with four goals in five games. I don’t remember Dickov being much of a problem to Charlton in the past (though I may be mistaken), so hopefully, our defence will know what to expect and will be able to cope. The best player we will face is Wes Hoolihan, and he reminded everyone of Andy Reid in that Valley match; he will need to be watched closely by Holland and ZiZi. A defeat in this game would have the play off chasing hovering pack lapping over our toes, so that cannot be contemplated. A draw will provide further distance between Charlton and the top of the table teams who will soon be disappearing over the horizon leaving the Addicks beached like a Blackpool ferry. Pedro45 therefore just has to forecast a win, 2-0, which is about due away from home. Although I’m not going, I am confident of this result. My one-to-watch is going to be Darren Ambrose, who can be a key man in the thirteen-game run in. Darren has nearly all that you require to be a good footballer – stamina, skill, touch, vision – but he lacks in some areas (possibly attitude and confidence). We need Dazza to be on top form over the next three months, and if he can respond with corners and free-kicks that do beat the first defender; crosses that meet Charlton heads; and shots that go in the corner of the goal rather than over the bar, he could be a bit of a hero. Only he knows if he has the balls to be one. A combination of a wife returning from holiday; a mother being ill in hospital, and me being inundated with work have delayed a report on this top of the table clash. Sadly, with a 2-goal lead at half-time, Charlton could not hang on as they conceded two goals in 80 mad seconds. 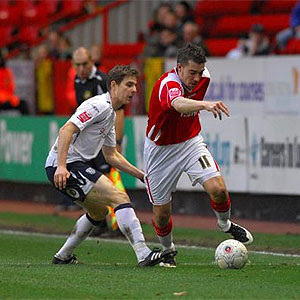 Charlton had taken the lead after 15 minutes when a great move involving Lloyd Sam and Andy Gray led to Darren Ambrose stroking home the initial goal from eight yards. Twenty five minutes later, another flowing move involving Sam and Greg Halford saw the latter’s low cross turned into his own net by ex-Addick Danny Shittu (left). I was quite pleased at that time (modest understatement) as I had forecast that he might score! Although McAnuff hit the post in injury time, the Addicks had been so dominant that everyone in the near sell-out crowd at half time was convinced that Charlton would be right back in the mix at the top of the table. Sadly, ten minutes later, that dream was in tatters. First, half time sub O’Toole, only able to play due to his midweek sending off being rescinded, slid in between the centre backs to bring the game alive. It looked offside on the day, though TV replays suggest it wasn’t. From the kick off, Watford won the ball back and won a corner after McCarthy cleared behind. It was swung in to the edge of the six yard box, and Shittu climbed above Jonathan Fortune to power a header home. The fact that Fortune did not leave the ground, almost certainly due to Shittu’s hands being placed firmly down on both his shoulders seemed irrelevant to the referee and the equalising goal stood. I was quite upset at that time (modest understatement) as I had forecast that he might score! A complete contrast to the first half, it was now the visitors who dominated the match. Substitutes Jerome Thomas and Lee Cook (for Sam and Ambrose) made little difference, and neither did Chris Iwelumo who came on for Gray. It is fair to say that this was a disappointing result for Charlton, but not the end of their league hopes; they certainly showed that when they play well, they can beat any team in this division(Watford were top prior to the weekends fixtures). The pain is down to the inconsistency that has pervaded the whole season so far, either from game to game, or within one single match as per this weekend. This is what Alan Pardew need to work on in the lead up to the next three, very, important matches. Charlton plc announced this morning that it is seeking approval from shareholders to raise up to £20m through the issue of a new convertible bond.Shareholders will be asked to approve the issue of up to 66,666,667 convertible secured corporate bonds, each having a face value of 30p, at a general meeting of shareholders on March 10th. Some £14m of the proposed issue has already been underwritten by five existing Charlton plc directors - Richard Murray, Derek Chappell, Bob Whitehand, Sir Maurice Hatter and David Sumners.The total sum raised will be used to repay recent loans made by these directors to support the company following relegation from the Premier League, and to provide working capital for the company during the remainder of the current season. Now, this money is not for new players, that much has been made clear, so fans should not expect to see David Villa or even Darren Bent coming to the club in the very near future. It is to repay the loans that the clubs directors have made to tide things over during a somewhat "sticky" patch. A total of £11million was lent to the club, and through this raising of funds, that money can be now paid back to the directors. The directors have all pledged that pretty much the equivalent of the loans they made will be invested in the bond (which can be converted to shares) issue, and therefore sums of around £14m have already been raised. Interest accrued from the loans will also be used to buy bonds. The other noteworthy point from this mornings news is that the club are insisting that the only investors who can buy the rest of the bonds have to either be invited by them or are registered investors. So at present, we don't need to worry about the ownership of the club going elsewhere. There is also a minimum investment of £225,000, so us "normal" supporters don't really have an option to increase our shareholding. Finally, and I doubt this will make much difference to fans on a day to day level, Richard Murray has stood down as Chairman on the PLC to become Chairman of the Football Club (taking over from Martin Simons). This is so he can work closer with Alan Pardew on football matters and leave strategy to new Chairman Derek Chappell. What is the Difference between a Hornet and a Bee? A couple of divisions I guess? 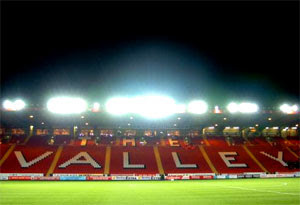 Watford visit the Valley on Saturday in a must-win home game for Charlton. Although in the context of a whole season, one game does not matter too much, this one match is crucial because a loss will put Charlton ten points behind their top-of-the-table opponents, and therefore, realistically, unable to overhaul them before the end of the season. A win, however, would put Charlton right back in the automatic promotion mix, and set up the final fourteen games of a very inconsistent season. The glumness that pervaded the clubs fans after the midweek draw at Hillsborough – Charlton’s first goalless draw of the season - must be dismissed, and Addicks fans must turn up for this match as they did the last home game. That, quite simply, means being noisy, supportive, loud, and passionate. We did it for the last London derby, and although it is arguable if Watford is in London, we must do the same again. Luke Varney admitted before last Friday’s game that the crowd noise was a key factor in the performance, and a repeat, with a full contingent of home fans expected, is paramount. So who will Alan Pardew be wanting to select for this vital game? Well, he does not seem to have a full squad to choose from, as a few minor injuries are starting to creep into the squad. In goal, we can expect to see Nicky Weaver keep his place, especially after Darren Randolph joined Bury on a month’s loan late last week. Weaver has been on top form recently, and made three very good saves in Yorkshire on Tuesday to keep a clean sheet. Let’s hope he can do so again. The defence had to change in the match against Wednesday, as Madjid Bougherra succumbed to a foot injury from the previous game. He was replaced by the formidable Jon Fortune, and big Jon, if selected, will be key here in using his height to win the battle against the towering Henderson. Alongside side him, we can expect to see Greg Halford continue at right back after two reasonable games, his first for the club. Paddy McCarthy will play in the centre where he is becoming rock-like with massive performances in every game. Paddy has always given 100%, even when he was making error-strewn appearances early in the season, but now he has cut out the mistakes, he has a good chance of featuring in the player of the season awards. Kelly Youga will no doubt continue at left back, with his 5-booking suspension not taking effect until next week. He should be fresh enough after leaving the pitch before half time on Tuesday night. In midfield, Matt Holland and Zheng Zhi continue to plough on in the central positions. They both run miles in every match, and you cannot fault either for effort. Holland was unlucky to hit the post on Tuesday, and ZiZi missed a chance late on too; both will be hoping for better finishing and I do fancy our Chinaman to score in this match. Out wide, the two places will be taken by a couple from the four wing men that Pards has to chose from. Lloyd Sam and Darren Ambrose are incumbent, but neither has been setting games alight over recent matches. That could give a chance to one or both of Jerome Thomas, apparently now back in training after injury and illness, and/or Lee Cook, also now fit, who could feature against his former club. Subs from – Elliott, Moutaouakil, Sodje, Bougherra, Powell, Basey, Racon, Semedo, Sam, Cook, Iwelumo, McLeod. Watford themselves have the best away record in division, with ten wins so far; they will be looking for legs eleven, and the chance to remove a big rival for a promotion place. If they can get rid of Charlton, then realistically, they can discount any other teams below them too, and that means they will be confident of finishing in the top four places in the league. 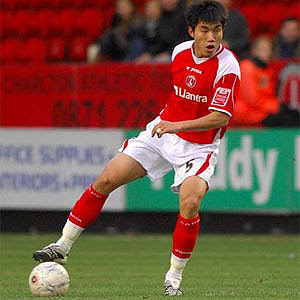 Although Charlton had the better of the game a month ago at Vicarage Road, the Hornets will be boosted by the return from international duty of ex-Addick Danny Shittu (oh no, not another ex-player to score against us? ), and by their other two recent defensive signings. They will also have O’Toole available after his midweek sending off was rescinded. My one to watch in this key match will come from the heart of the team. The defence will need to play very well, and the attack will need to create and score goals, but the engine room is where this game could be won on the pitch. Zheng Zhi is due a big game, and I believe that he might just have it here. The skipper, alongside him, has done huge amounts of running, but Zizi is the classiest player in the squad, if not the division. In recent times, the couple of days rest he has had since his last game will seem like a between-season break, such has been the frequency of games he has played over the last few months. I’m banking on him having a stormer, and being the man to really fire up the Red Army. Pedro45 is not going to sit on the fence this week – in my head, I think it will be a (1-1) draw, but this is one match that I will rule with my heart, and I’m going to predict a 1-0 win. Anything other than a victory is unthinkable to Addicks fans, so let me start the rallying call that should crescendo as the players take to the field. We can win. We must win. We will win. Not much to add to any other reports of this game, although I haven’t had a chance to read any as work is a nightmare at the moment. I listened to the game on the radio, and interrupted that with the in-game SSN reports. It was interesting to compare the opinions on both channels, and that of the highlights shown on SSN after ten o’clock. Radio London obviously had a southern bias, with the referee and in particular the linesman being useless. It was strange how attacking throw ins by Greg Halford seemed to end up with Showunmi on the half way line, but that’s commentary for you! Although the home team seemed to have the best chances, with Nicky Weaver making three very good saves by all accounts, it was a close game, and Matt Holland did hit the post with a drive from ten yards or so in the first half. Luke Varney did get the ball in the net in the second half but he was adjudged to be just offside by the linesman who apparently got every decision wrong. Oh, and Paddy McCarthy was fantastic! The reporter at the ground for Sky needed to be woken up every time the studio went to him for his opinion. This report balanced the Radio view and was full of northern negativity – Wednesday were always the better side; Weaver had kept Charlton in the game, etc etc. Varney was rightly flagged offside apparently…hmmm. Then you see the highlights and it was pretty much all Charlton bar one very good save from Weaver. Holland’s shot was unlucky, and other chances came and went. The Varney “goal” was a bit too quick for me to replay, so I couldn’t tell if he was on or off – maybe others can confirm? The other things to note from the match were that Kelly Youga was picked upon apparently, and after being punched, and booked for receiving it, he was withdrawn by Alan Pardew to ensure that he was not sent off (and consequently a five game ban! ), and that Lee Cook made his debut for the out of sorts Lloyd Sam after an hour. Cook almost set up a wining finish but it wasn’t to be. Sadly, we were not helped by other results, with Scunthorpe losing to a late goal by Bristol City, and Southampton failing to claw back the three goal lead they gave Stoke. Watford hung on with ten men to win 1-0 and continue to head the league, so it is the leaders we will face on Saturday at The Valley. That game now takes on huge significance, and could be one of the defining moments if Charlton are to win automatic promotion out of this division. After well and truly dismissing the Eagles, Charlton’s attention turns to the Owls of Sheffield Wednesday at Hillsborough on Tuesday night. This is the first in a double header of consecutive Sheffield away games, with just Saturdays home game against Watford sandwiched between. A win would keep the pressure on those four teams above Charlton in the league, though a winning result is unlikely to move the team up any positions at all. Alan Pardew (left) has a tough job on his hands this week – the euphoria following Friday nights win must be controlled; as other writers and players at the club have pointed out, to lose against Wednesday after the home win would be useless; Charlton simply must start stringing consecutive wins together if they are to fully justify the tag of being good enough for promotion. Pardew is unlikely to tinker much with the team, and the only changes are likely to be replacements for any injuries picked up since Friday. One such injury Pards will be hoping clears up in time will be the shin damage that scorer Luke Varney gained after one particularly vicious challenge. Varney admitted today that the leg was stiff, but with luck and the knowledge that he is guaranteed a place in the initial line up if fit enough should ensure he plays from the start. Jerome Thomas is still out apparently, although his illness which caused his omission on Friday has now become a hamstring injury according to the club. Subs from – Randolph, Moutaouakil, Fortune, Sodje, Powell, Basey, Racon, Semedo, Iwelumo, McLeod. I just cannot see Pardew wanting to change the defence at all – Weaver is playing well; Bougherra and McCarthy are looking solid and playing with consistency at last; and Kelly Youga now has a solid opposite number in Greg Halford who gives the team balanced attacking and defensive options judging from his debut game on Friday. It is unlikely that Varney will be paired with anyone other than Andy Gray, with Chris Iwelumo coming on as a late substitute either in search of additional fire power, or defensive acumen, depending on match circumstances. On the wings though, if options were available, then Pards may have thought a little before deciding who he might pick. Lloyd Sam has great ball skills and works hard, but he really needs to start making all those runs count and get the odd decent cross or an on-target shot in that his build up play deserves. Lloyd must realise that once he beats his man the once then that is the time to cross the ball or shoot, and not to go back and try to humiliate the full back time after time before being closed down by other defenders. Darren Ambrose also has great room for improvement; in the last two matches, Ambrose’s corners and free kicks have been quite poor. He must start to make the right choice in these situations, and if the initial play is not looking like it will work, then Ambie must be strong enough to vary the planned delivery. And it is that delivery where Charlton fans have been most exacerbated with about 90% of dead balls failing to get past the first defender. Get it up Darren! Sheffield Wednesday have themselves a few injury problems, and that seems likely to keep out ex-Addick Franny Jeffers, and current Addicks player Sam Sodje’s brother Akpo. Likely to lead the line is on loan striker Enoch Showunmi, and the game should also feature veteran midfielder Graham Kavanagh who is on loan from Sunderland. Kavanagh has had a distinguished career, playing for a large number of clubs and doing very well wherever he has been. He may be long in the tooth now, but Holland (who should know what to expect) and Zhi will need to put themselves about and not let the Irishman dominate the game as he likes to do. Pedro45 would love to predict an away win for the Addicks, but will not for this game for two reasons – one, is that every time I seem to think we will win, we get stuffed, and every time I say we will lose, we get the correct result and three points. Secondly, Wednesday have a fascinating home record this season, and going in to their fifteenth home game, they have yet to draw. For these reasons, Pedro45’s score prediction is a 1-1 draw. My one-to-watch in this match is going to be Paddy McCarthy (left). Our Irish centre back has been right back on form since Xmas, and is now a fixture in the team that will be tough to budge. As long as he plays sensibly, with heart but his head ruling, he is rock like. He also has to take lead at the back, as Bougherra is returning to his old club and will no doubt get some stick for deciding to leave them just over a year ago. The home team will be dangerous, especially early on as Addicks fans will remember from back in August when they took a 2-0 lead at The Valley. The key point to remember from that match though, is that Charlton won it after a stirring second half fight back. I’m hoping that won’t be necessary in South Yorkshire, and that Charlton can deflate any new found Yorkshire confidence and continue to pressure the teams above them in the table with an easy win. It can be done, if the belief is there. Charlton Athletic Online can exclusively reveal the real reason why Charlton succumbed last week to a relegation-threatened Scunthorpe team at Glandford Park – Socks! Yes, it was the socks fault that the Addicks lost the game 1-0. Either side of excellent winning home performances, the result last Saturday was a real shock, and this could possibly lead to a Football League investigation. Pedro45 can now divulge the amazing news, which had been kept under wraps for a week but was leaked via the match programme last night; internal murmurings indicate that heads will roll due to this oversight by the programme editor and picture researcher! So what, you may ask, has the result got to do with the blue socks the team wore? Pedro45 has learnt that Kelly Youga and other un-named members of the squad had a bet prior to the match, unbeknown to manager Alan Pardew, which the Frenchmen won. The forfeit for losing this bet was that all the team, barring Youga, were made to play the game against Scunthorpe with their socks on the wrong way round. Have you ever worn long socks the wrong way round? It is very uncomfortable, especially if you then have to not only put on football boots, but try to kick a football too. 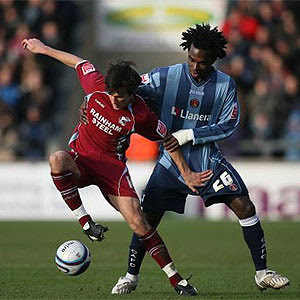 The blue socks are meant to be worn with the CAFC lettering to the front of the sock, and the Joma logo at the rear. Youga was the only Addick with his socks on the right way (see left), and therefore the only player comfortable in his footwear, and capable of making a decent pass. The evidence was carried on pages 30 and 31 of last nights programme, where the forfeit is clearly evident in a number of the photographs from that game, and they show the level of discomfort the rest of the side were in during that match, bar Kelly, . Evidence is contained in some of the damning images which are reproduced here too - you can tell from the expressions on Andy Gray (top pic) and ZiZi's (bottom) faces that they are feeling the pain, whereas Youga looks positively happy. Other blogs may claim that it was in fact simply Kelly who had his socks around the wrong way, but with the fantastic form being shown by Charlton’s left back in recent weeks, that simply cannot be the case. Youga has been outstanding since he came into Pardew’s side early in January, with consistent high class performances. How could anyone play as well as he is with his socks on backwards!?! Pedro45 believes that Youga’s sock prank on the rest of the team is the sole reason for the poor performance in Lincolnshire, and does go some way to explaining Darren Ambrose’s poor corner kicks, plus Yassin Moutaouakil’s feeble attempt to clear the cross which led to the only goal of the game. Oh, that was sweet. A very one-sided game, with Nicky Weaver a spectator for almost the whole match, and the points going where they belonged thanks to two second-half Luke Varney goals. Varney (left) had a fantastic game and really is bang in form at present. He was unlucky to hit the post in the first half, where his trade mark cut in from the left wing left yet more defenders in his wake, but sadly he couldn't beat the keeper at the near post and the ball thudded back into play. His first goal came on the hour mark after a half way line free kick from Matt Holland was flicked on by Andy Gray and Varney steered it home from ten yards. Five minutes from time, Varney repeated his trick of cutting in from wide left, and this time blasted a right footed shot at the far post; the fact that it deflected in off a defender takes nothing away - it was Varney's goal! Nor was Varney the only Addicks player to go close to scoring. In the first half a Varney cross was met by a powerful Zheng Zhi shot from eight yards that unluckily hit the keeper. Earlier, Greg Halford showed superb skill to turn his marker on the edge of the box, but shot across goal and narrowly wide. Halford (left) had a very good game at right back in place of the dropped Moutaouakil, and looked absolutely at home. His support play was excellent in the first half, and he was always trying to set Lloyd Sam, ZiZi, or Varney free through the channels. He also has an enormous long throw which Charlton failed to harness in this match, but will in forthcoming games I expect. The throw also relieved a lot of pressure when used from defensive positions. The defence did an admirable job; Paddy McCarthy and Madjid Bougherra didn't win much first phase ball, but with the help of the midfield and full backs always cleaned up anything that needed to be afterwards. A mention too for Kelly Youga who had another fantastic game; always looking to get forward, his defensive play was at it's peak in this match, and he made one very important shot saving tackle early in the second half when the scores were still level. Holland, as always, was inspirational, running and running all game long, and covering so much ground, and once more he was well supported by ZiZi (suffering no obvious jet lag ill-effects thankfully). The only down side was the lack of performance from Darren Ambrose, who was anonymous in the first half and eventually withdrawn with ten minutes left. Yet again, some of his corner taking, passing and dithering left a lot to be desired! That just leaves Sam and Andy Gray from the starting eleven, who both toiled manfully without much space. Both nearly scored, Sam shooting just over and Gary having a good effort saved near the end. Substitutes Jose Semedo and Chris Iwelumo came on to shore things up during the last few minutes, and big Chris almost made a goal with one late towering header. The performances of the two full backs were very good, but man of the match has to go to Luke Varney, who got up off the floor when felled by an awful over the top lunge to bury the opposition. I just hope he is fit for next Tuesdays game! Alan Pardew (left) must be the only person in the World who has a love for two South London Championship football teams. I just hope that his professionalism comes through tomorrow night, and he tries to ensure that his current employers are the ones who walk out victorious. I don’t actually get very excited when games against Croydon come around; I refuse to travel to that dump of a ground, as I have no intention of paying money into the coffers of idiots like Noades, Goldberg, or the Tango-man himself. I get upset when we do badly, and over-excited when we beat them, as do all Addicks I guess. Ultimately, this is just another league game, and one which Charlton need to draw something from. Subs from – Randolph, Moutaouakil, Fortune, Basey, Racon, Zhi, Sam, Iwelumo, McLeod. Quite simply, the error by Yassin last week will almost certainly mean he is left out in favour of Halford, who had a storming game for the reserves in midweek, although he was up against meagre opposition. My one-to-watch in this game is Madjid Bougherra. Magic has done well recently and can write himself into Addicks folklore if he scores a winner tomorrow night. It is, however, his defending that will be most important in this game, and if he can help garner Charlton three more points, that would do nicely. Pedro45’s score prediction has a poor look about it; with a make or break game such as this (a defeat could disintegrate any confidence and spell the premature end to any hopes or dreams for the season...) I am desperate to predict a win. But I wouldn’t be surprised to see us ship four goals if hearts rule heads, but would hope that the addition of Halford may solidify the rearguard and provide options in attack. Maybe in that case could we sneak a one-nil or two-one win? It could even be a tight nil-nil draw...or even a resounding victory in a similar way to the West Ham game of last season. What is going to be key is to keep all eleven players on the park all night, as anything less may spell trouble in more ways than one. After all that I’m going to hope that I’m wrong and predict a 2-0 defeat. It would be lovely to win and put more space between the teams - a loss for them would possibly end there dreams for the season..? Oh dear. Just when everything seemed to be going well and heading in the right direction it is back to earth with a hard bump. Charlton lost this game thanks to a single Scunny goal on a bitingly cold and blowy day. It wasn't a good move or anything: it was all the fault of one person - Yassin Moutaouakil. A long cross was swung over to the far post after an hour. The right back was alone but tried to do the sensible thing and knock the ball behind for a corner and safety. Sadly he missed the ball with his better right foot and simply saw the ball bounce off his left peg straight to Scunthorpe’s leading scorer Paterson eight yards out. 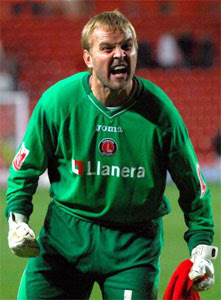 Paterson buried the ball into the corner of the net giving Nicky Weaver no chance. Yassin also wasted Charlton's best chance wastefully shooting wide from 12 yards with an open goal at his mercy when the scores were still level. It wasn't his best game by a long chalk. Moots wasn't the only defender to make a mistake but his were crucial. Why the errors crept back into the teams play is anyones guess - Weaver and Bougherra both fell in clearing the ball and, though hurt, were lucky not to be punished. McCarthy’s distribution was awful and Youga as trying too hard against his former club and kept running down lines that led nowhere. This should not take anything away from Scunthorpe who just deserved the win. Sad to say they even accomplished it playing with ten men for the last 20 minutes after Butler was sent off for a second bookable offence - this time tripping Ambrose. Both Addicks wide men - Sam and Ambrose - were poor but it was the right sided players consistently terrible free kicks and corners which had most impact. The only bright spot was the continued form of Matt Holland who once more gave everything when others were having off days. Zheng Zhi seemed to have this weeks travel plans on his mind or maybe it was Butler's horrendous two foot challenge in the first half which was playing on his mind most. In attack Pards started the Gray/Varney partnership but they had so little protection from the poor referee and barely mustered a shot between them. Late pressure was applied but shots by sub McLeod and Holland didn't really trouble the home keeper. My mood wasn't helped by the whinge-ing supporter sat beside me who kept up a constant commentary of the bitingly obvious. He wasn't wrong - I just wish he hadn't bothered trying to get me and others to acknowledge all he was moaning about. This was a real blow after the excellent midweek win and puts added pressure on to win all remaining home games. A brief word about Scunthorpe, as it was my first visit there - very suburban with lots of arched windows and plenty of stained glass, and not the semi-industrial town that the steelworks image depicted. That was a hectic last day of the transfer window for Alan Pardew and Charlton – out went Andy Reid to Sunderland for £4m, and Aswad Thomas to Accrington on loan, and in came loanees Greg Halford and Lee Cook from Sunderland and Fulham respectively. Hopefully, the weekend will be quieter. Charlton’s new looking squad take on Scunthorpe on Saturday afternoon, weather permitting. The forecast itself is poor, with arctic winds blowing snow down the east coast today, and a very cold night in store for Lincolnshire it seems. It the snow does get as far south as Scunny, and if the pitch is not protected, then there is a possibility that the 1000 plus Charlton fans making the trip may be in for a disappointing day out. Hopefully though, the game will go ahead, and forking out for my train ticket will not have been in vain. 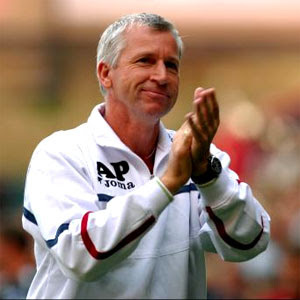 Now Alan Pardew has his squad settled for the last few months of the season (barring emergency loans which have not been ruled out yet), he can concentrate on continuing the good form shown recently, and try to get the Addicks even higher up this league. Reid, who will be missed in the long term, was injured anyway, and would not have featured for a few weeks yet, having only just returned to training after resting his knee for a couple of months. Thomas only made the bench for League Cup games, and is one for the future; the experience he gets in tier four will stand him in good stead. But with the two new signings hopefully fit and ready (why get them in if they are not? ), and with almost all the rest of the squad fit, Pardew has a large group of players to pick his team from this weekend. We can expect midweek hero Nicky Weaver to start in goal once more. It has taken some time, but at last we are seeing what a good goalie he is. His two second half saves on Tuesday (one early, one late) won us the game, and though Darren Randolph is an able deputy, Weaver is cemented between the sticks for the foreseeable future based on recent displays. The defence is, all of a sudden, looking like a strong area of the team. Gone has gone the lack of communication and unforced comic errors of early in the season, and in has come a steely determination coupled with a “they shall not pass” attitude. The two full backs – Yassin Moutaouakil and Kelly Youga – have fitted in to the side extremely well since the new year, and it would be a surprise if either was dropped for this game. Halford is most well known for his play at right back, but he is also a utility player – it would be surprising to see him played in favour of Moots on the right side in this match but you never know with Pards. Youga has been a revelation recently, but Chris Powell is rested, and has been sitting in the wings for a month now, and Grant Basey has also bided his time since coming back from his injury. Both are keeping Kelly honest – he knows that if he fails to deliver then either the veteran or the youngster will be aching to step in and replace him. The centre back pairing of Madjid Bougherra and Paddy McCarthy has now gelled, but Jon Fortune and Sam Sodje, when his cut hand/arm heals, will both be able back-ups. In midfield, we have the incumbent Matt Holland and Zheng Zhi, who are both doing a fine job. We seem to criticize one when they fail to be man-of-the-match, but both are playing at a consistently high standard at present, running their hearts out, making tackles, and producing a goal threat too. With Jose Semedo and Therry Racon (who failed to get out on loan anywhere it seems) in reserve, this area is covered amply too. The addition of Lee Cook is interesting, simply because Jerome Thomas is still at the club. If JT had waltzed off somewhere, then fans would see the reason why Cook has been brought in. Now, we have wingers in spades – Darren Ambrose (who can play centrally too) and midweek goalscorer Lloyd Sam have the shirts at present, but Thomas and Cook will be pressing hard for a bench place. I’m not sure who Pards will pick here, but he does tend to stick with players until they fail to perform, then switch things, so Dazza and Lloydy had better keep doing the business. In attack, the injury to Chris Dickson is a blow to the lad, and us fans who love it when we see a Roy of the Rovers character burst through. He will be back, but not for a while sadly. Thankfully, the other forwards are still around, and no potential loan deals were agreed before Dickson fell over (metaphorically). Izale McLeod will see this as an opportunity to push hard in reserve games, and Chris Iwelumo, Luke Varney and Andy Gray will no doubt be rotated as the various games dictate. I make that 22 squad players who realistically have a chance of getting a game at least every now and then in the last four months of the season. With Ben Thatcher, and Dickson (and maybe Cory Gibbs?) likely to be available in time too, we have the players who can get us promoted if they play to their potential. Sure, Andy Reid is a loss, but not a season ending one in the way that selling Parker or Murphy could have been seen. Subs from Randolph, Halford, Fortune, Powell, Basey, Semedo, Cook, Thomas, Iwelumo, McLeod. Scunthorpe themselves have made what they hope will be a key signing – Geoff Horsfield. The feed the horse man will be hoping to bully some defenders into conceding goals to him and he will try to take the Iron out of the relegation zone. Scunny haven’t won for quite some time (12 games I think? ), and are not in very confident mood. They do score goals, especially at home, but have a leaky defence that Charlton should be able to breach a few times. The home team will have nothing to fear though, and will look at this as a no-lose game so can really go for it. A real minnow against the giant (of this league) as it was on the first day of the season – they upset Charlton and forced a draw that day, hopefully they won’t be able to do the same in Lincolnshire. Pedro45’s score forecast is a 2-0 win for the Addicks. That should warm up the travelling fans! My one-to-watch in this match has to be Kelly Youga. Our Kelly became something of a legend in Lincolnshire during his initial loan spell between August and December, and it was only the loss of other left backs that forced Pards to recall him from his time with Scunthorpe. Since then, he has maintained his blossoming legend status, but in SE7! 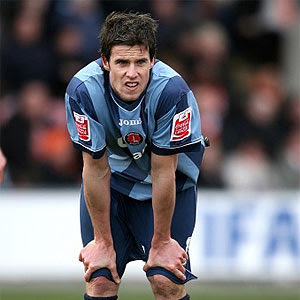 Kelly did get sent off for the Iron twice in December, but he also scored his one and only goal that month. It will be interesting to see what sort of a response he gains from the home crowd, but hopefully they will be thankful of his time with them and the kind words he said once he had returned to Charlton. A win in this match, weather permitting, could see Charlton move up a couple of places above the fifth place they currently occupy. It would also take Charlton to fifty points, and almost safe from relegation (I'm ever the pessimist!). Without Andy Reid, we may be gloomy, but at least we won’t go down. And if we aren’t going down, we might as well concentrate on trying to win promotion. Three more points at Scunthorpe will keep the pressure on and with the other clubs near the top of this league also meddling in the transfer window we may see some subtle changes in position over the next few weeks as the men are sorted out from the boys.